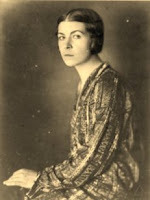 Olga Rudge was an American violinist and writer born on April 13, 1895 (Brahms was 62 years old.) Today, she is mostly remembered for her relationship to Ezra Pound, an often misunderstood poet-musician, and for having lived more than 100 years (1895–1996). As far as I know, Rudge never studied at a conservatory but became a violin virtuoso nonetheless and began her career as a soloist in 1918. She often played before distinguished political dignitaries but stopped concertizing after the Second World War. She was also instrumental (during the 1930s) in bringing the works of Vivaldi to international attention and acclaim. She discovered over 300 Vivaldi concertos which had been lost or forgotten. Rudge died on March 15, 1996, at age 100.